By choosing an AGM battery with advanced battery technology, you will get an outstanding battery that is capable of powering the most demanding start-stop vehicles with more than 150 electrical accessories. AGM batteries are the premium choice for performance, advanced start-stop vehicles with regenerative braking and high electrical demands. An AGM battery includes innovative technology that offers up to two times the life of a standard flooded battery as well as superior performance over the life of the battery, to better meet the demands of Australia’s popular vehicles. In a Delkor AGM battery, the sulfuric acid is absorbed within AGM separators and each separator holds and equally distributes the battery’s acid, ensuring constant contact between the absorbed electrolyte and our patented PowerFrame® grid technology. This generates reliable electrical output for superior performance. 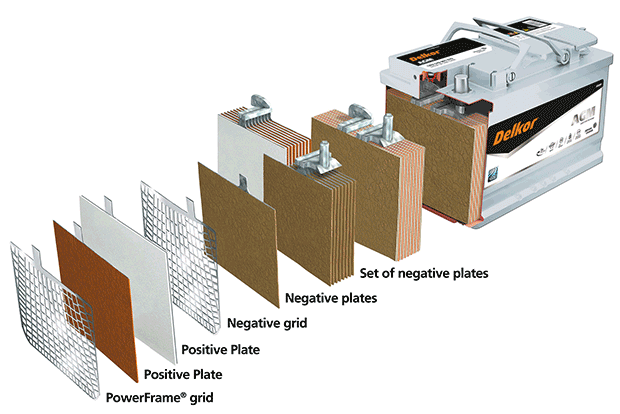 Each cell of the battery is made up of positive and negative plates along with the AGM separator. These mats are tightly compressed to hold the paste on the plates which improves cycling, vibration resistance and extends battery life. Two times the service life as compared to standard flooded battery. Better electrical performance and higher power output compared to a standard flooded battery. Certified non-spillable and will not leak, allowing for greater flexibility of installation, such as in the boot, under the bonnet and in the cabin. Choose a Delkor AGM battery for vehicles with high electrical demands, demanding electrical accessories and start-stop technology with regenerative braking. Read more about Delkor AGM technology here.